For other uses, see Erica (disambiguation). Erica is a genus of roughly 860 species of flowering plants in the family Ericaceae. 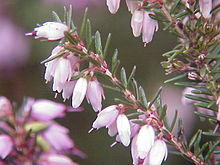 The English common names heath and heather are shared by some closely related genera of similar appearance. The genus Calluna was formerly included in Erica – it differs in having even smaller scale-leaves (less than 2–3 mm long), and the flower corolla consisting of separate petals. Erica is sometimes referred to as "winter (or spring) heather" to distinguish it from Calluna "summer (or autumn) heather". The Latin word erica means "heath" or "broom". It is believed that Pliny adapted erica from Ancient Greek ἐρείκη. The expected Anglo-Latin pronunciation, /ɪˈraɪkə/, may be given in dictionaries (OED: "Erica"), but /ˈɛrɪkə/ is more commonly heard. Most of the species of Erica are small shrubs from 20–150 cm (8–59 in) high, though some are taller; the tallest are E. arborea (tree heath) and E. scoparia (besom heath), both of which can reach up to 7 m (23 ft) tall. All are evergreen, with minute, needle-like leaves 2–15 millimetres (0.079–0.591 in) long. Flowers are sometimes axillary, and sometimes borne in terminal umbels or spikes, and are usually outward or downward facing. The seeds are very small, and in some species may survive in the soil for decades. Dulfer published the last revision of the genus Erica in the 1960s, treating 605 species. Many new species have subsequently been described (particularly in South Africa) and a further 83 have been included in Erica from former “minor genera”, such as Phillipia Klotzsch and Blaeria L. A more recent overview of Erica species is provided in an electronic identification aid, but a modern taxonomic revision of the genus as a whole is still lacking. A number of increasingly detailed phylogenetic hypotheses for Erica have been published based on nuclear ribosomal and plastid DNA sequences. The closest relatives of Erica are Daboecia (one or two species) and Calluna (monospecific), representing the oldest surviving lineages of a, by inference, ancestrally Palearctic tribe Ericeae. The small number of European Erica species represent the oldest lineages of the genus, within which a single, order-of-magnitude more species-rich, African clade is nested. Within the African clade, Cape and Madagascan/Mascarene species respectively represent monophyletic groups. Around 690 of the species are endemic to South Africa, and these are often called the Cape heaths, forming the largest genus in the fynbos. The remaining species are native to other parts of Africa, Madagascar, the Mediterranean, and Europe. Like most Ericaceae, Erica species are mainly calcifuges, being limited to acidic or very acidic soils. In fact, the term "ericaceous" is frequently applied to all calcifuges, and to the compost used in their cultivation. Soils range from dry, sandy soils to extremely wet ones such as bog. They often dominate dwarf-shrub habitats (heathland and moorland), or the ground vegetation of open acidic woodland. Plants of this genus are eaten mainly by the larvae of many Lepidoptera species, including emperor moth, garden tiger moth, true lover's knot, wormwood pug, the silver-studded blue, and the Coleophora case-bearers C. juncicolella and C. pyrrhulipennella. Some species of sunbirds are known to visit and pollinate Erica. Two such species are the southern double-collared sunbird and the orange-breasted sunbird. ^ Manning, John; Paterson-Jones, Colin (2007). Field Guide to Fynbos. Struik Publishers, Cape Town. p. 224. ISBN 978-1-77007-265-7. ^ Scarborough, John (1992). Medical Terminologies : Classical Origins Oklahoma Series in Classical Culture. 13. University of Oklahoma Press. p. 20. ISBN 978-0-806-13029-3. ^ Gledhill, David (2008). The Names of Plants. Cambridge University Press. p. 156. ISBN 978-0-521-86645-3. ^ Dulfer, H (1964). "Revision der Südafrikanischen Arten der Gattung Erica L. 1 Teil". Annalen des Naturhistorischen Museums in Wien. 67: 79–147. JSTOR 41769215. ^ Dulfer, H (1965). "Revision der Südafrikanischen Arten der Gattung Erica L. 2 Teil". Annalen des Naturhistorischen Museums in Wien. 68: 25–177. JSTOR 41764839. ^ Oliver, E.G.H. (2000). Systematics of Ericeae (Ericaceae-Ericoideae): species with indehiscent and partially dehiscent fruits. Bolus Herbarium, University of Cape Town. ISBN 978-0-7992-2202-9. ^ Oliver, E.G.H. ; Forshaw, N. (2012). "Genus Erica An Identification Aid Version 3.00". Contributions from the Bolus Herbarium. 22. ^ McGuire, Avery F.; Kron, Kathleen A. (2005). "Phylogenetic Relationships of European and African Ericas". International Journal of Plant Sciences. 166 (2): 311–318. doi:10.1086/427478. ISSN 1058-5893. ^ a b Mugrabi de Kuppler, A.L. ; Fagúndez, J.; Bellstedt, D.U. ; Oliver, E.G.H. ; Léon, J.; Pirie, M.D. (2015). "Testing reticulate versus coalescent origins of Erica lusitanica using a species phylogeny of the northern heathers (Ericeae, Ericaceae)". Molecular Phylogenetics and Evolution. 88: 121–131. doi:10.1016/j.ympev.2015.04.005. ISSN 1055-7903. PMID 25888972. ^ a b Pirie, Michael D.; Oliver, E.G.H. ; Bellstedt, Dirk U. (2011). "A densely sampled ITS phylogeny of the Cape flagship genus Erica L. suggests numerous shifts in floral macro-morphology". Molecular Phylogenetics and Evolution. 61 (2): 593–601. doi:10.1016/j.ympev.2011.06.007. ISSN 1055-7903. PMID 21722743. ^ a b Pirie, M. D.; Oliver, E. G. H.; Mugrabi de Kuppler, A.; Gehrke, B.; Le Maitre, N. C.; Kandziora, M.; Bellstedt, D. U. (2016). "The biodiversity hotspot as evolutionary hot-bed: spectacular radiation of Erica in the Cape Floristic Region". BMC Evolutionary Biology. 16 (1): 190. doi:10.1186/s12862-016-0764-3. ISSN 1471-2148. PMC 5027107. PMID 27639849. ^ Manning, John (2012). Plants of the Greater Cape Floristic Region: 1: the core Cape flora. Pretoria: South African National Biodiversity Institute, SANBI. ISBN 978-1-919976-74-7. ^ Shorter Oxford English dictionary, 6th ed. United Kingdom: Oxford University Press. 2007. p. 3804. ISBN 978-0199206872. ^ Thomas, C. D.; Glen, S. W. T.; Lewis, O. T.; Hill, J. K.; Blakeley, D. S. (1999-02-01). "Population differentiation and conservation of endemic races: the butterfly, Plebejus argus". Animal Conservation. 2 (1): 15–21. doi:10.1111/j.1469-1795.1999.tb00044.x. ISSN 1469-1795. ^ RHS A-Z encyclopedia of garden plants. United Kingdom: Dorling Kindersley. 2008. p. 1136. ISBN 978-1405332965. Wikimedia Commons has media related to Erica.